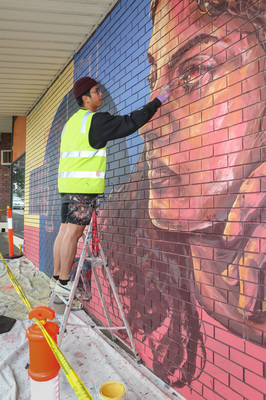 A Springvale-raised artist is transforming a Dandenong wall to celebrate a young leader. Mike Eleven’s latest mural is springing up at Mason and Foster streets in Little India, Victoria’s first Indian Cultural Precinct. His subject is Greater Dandenong Australia Day Young Leader of the Year award winner Aishwarya Pokkuluri. She was recognised for her volunteer work and for giving Greater Dandenong’s most vulnerable and marginalised young people a voice. 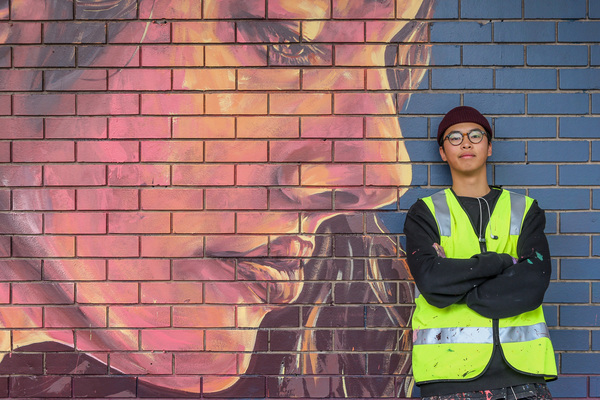 Mike Eleven said his mural included two portraits of Ms Pokkuluri, representing the two worlds young people from Indian cultural backgrounds often found themselves caught between. “The work depicts how Aishwarya moves between both worlds seamlessly and acts as a bridge between tradition and progress,” he said. Mike Eleven was named as one of Melbourne’s 40 most iconic artists in the Thames and Hudson Melbourne Street Art Guide. He was also the youngest artist ever to be part of the London Secret Walls live art competition and has completed a number of murals across Melbourne. The Journal met Mike back in Septemebr 2016 when he returned to his home town of Springvale South and transformed a blank brick wall into an image of inspiration. His sister Alisa Souvanthalisith was the subject of the striking blue portrait at Wardale Road and Noble Street. Mike said he grew up around the corner and attended the nearby Keysborough College, then Heatherhill Secondary School. “I felt obligated to give back to the community that brought me up,” he said. Mike found a love for art in his late teens through graffiti. He’s grown from a student sketching on schoolbooks to a full-time creative. His work joins a mural on the Mason Street car park by Rowena Martinich and Geoffrey Carran that takes inspiration from the colour and movement found in Indian textile and tapestry designs, and a painting of Mahatma Gandhi on a former substation in Halpin Way by artist Julian Clavijo. All three artworks will be finished by the end of May. In 2015, the State Government announced plans to create Victoria’s first Indian Cultural Precinct in Dandenong. A taskforce formed soon after to drive ideas for the project. Greater Dandenong Mayor Youhorn Chea said feedback from the community highlighted the need for more colour and vibrancy in the precinct. Melbourne’s South-East is home to more than 52,000 people of Indian origin. About 12,400 first generation Indian residents call the City of Greater Dandenong home.